The Chios Eastern Shore Response Team is a nonprofit organization that is run by volunteers only. All our projects are sustained by people from all over the world who are willing to put in their heart, time and power to address the situation of those seeking refuge on Chios. The open structures of CESRT enable everyone to take the initiative to unfold her/his ideas and creativity in terms of our projects. privileges in contrast to the perspectives of the people arriving on the island. 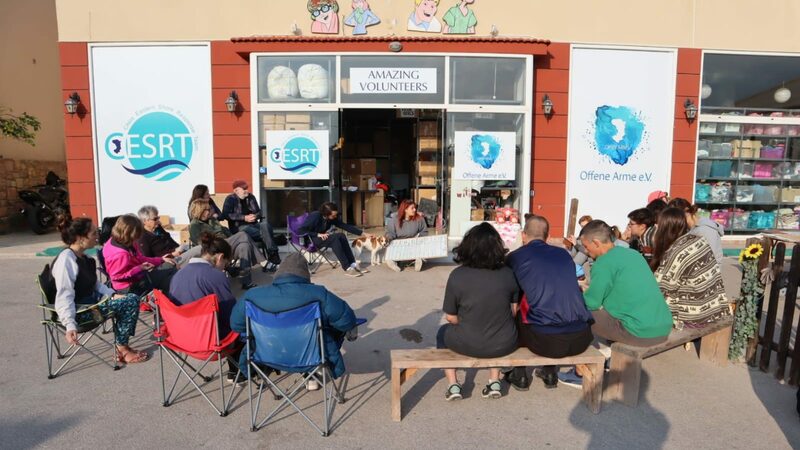 volunteer with the Chios Eastern Shore Response Team and Offene Arme e.V. minimum of two weeks for volunteering with us. we will need a police check that enables you to work with children. 3. We will check your documents and hopefully send you our approval. 5. In the meantime, you can check out the information for new arrivals in our FAQ. 6. Next thing you know, you will be part of an amazing team of volunteers.